Warren Heritage Society – Preserving, protecting, and promoting the history of Warren County and Front Royal, Virginia. Preserving, protecting, and promoting the history of Warren County and Front Royal, Virginia. How much do you know of Warren’s Heritage? See our Gallery Page to test your knowledge! Vendor & Parade Applications for the 49th Annual Festival of Leaves are available! Our collections prove to be an incredible treasure trove of local history! Help us continue to preserve, protect, and promote the history of Warren County! 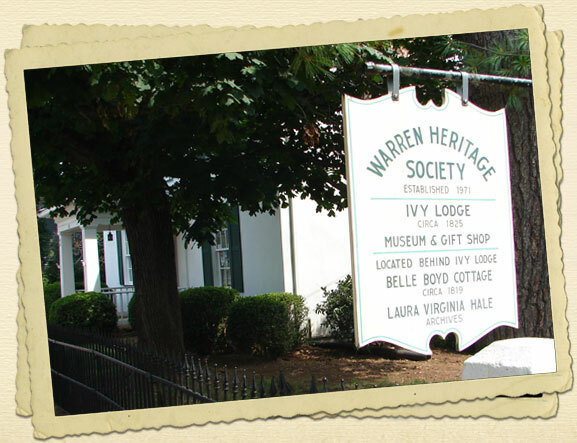 The Warren Heritage Society (WHS) is the Front Royal/Warren County community’s historical society, museum, and archives. Established as a non-profit organization in 1971, the Warren Heritage Society has held the Shenandoah Valley’s Festival of Leaves since that year. The Warren Heritage Society is located at 101 Chester Street, in historic downtown Front Royal, Warren County, Virginia, in the beautiful Shenandoah Valley. We are a non-profit organization dedicated to preserving our community’s history and sharing our history with our visitors. The Society periodically collected and displayed artifacts of local history in the Courthouse Square Law Offices, c. 1836, from the late 1960s-1980, at which point the c. 1819 Ivy Lodge — formerly the town library — became home for the museum’s exhibits. The Ivy Lodge Museum exhibits on town and county history, which include both permanent and annually rotating exhibits, was completely renovated in 2003. Ivy Lodge today also offers visitors a Gift Shop and Book Store specializing in local history, traditions, and crafts. Have a look around the site to learn more about us and what we do. If you have any questions please feel free to contact us. Please contact us with any questions you may have about Warren Heritage Society - Preserving, protecting, and promoting the history of Warren County and Front Royal, Virginia.